When it comes to area lighting, you can find at MechaTronix a unique series of LED coolers for IP67 outdoor designs, designed around the optics from our eco-partners like Ledil. Our patented CoolBlock® series create from 4000 lumen up to 20.000 lumen as a single unit. The LED boards can either be found as standard components from Lumileds (Luxeon XR-M and Luxeon XR-TX) or from a wide score of LED integrators like AduraLED, Cezos, Berg Hybrid Circuits, Audax,… All 3 form factors, 2x2MX, 2x6 and 3x11 have standard boards available with LED emitters from Cree, Osram, Lumileds, Plessey and a further score of A brands. 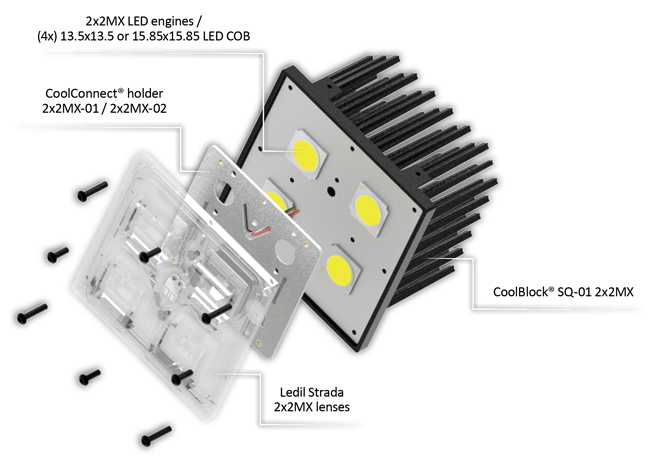 On the 2x2MX platform, we have even made it possible to assemble your units with standard COB LEDs size 13.5x13.5 - with these COBs on the platform you can operate even at higher lumen output, or run your design 10 degrees cooler for the same lumen. The optics come from our eco-partner Ledil, offering you a wide score of beam angles so you can relight your area with a minimum of units and a perfect homogenity in the lux levels. The CoolBlocks can be combined by simple interconnect accessories or with our CoolBeam® kits to powerful outdoor area lights.